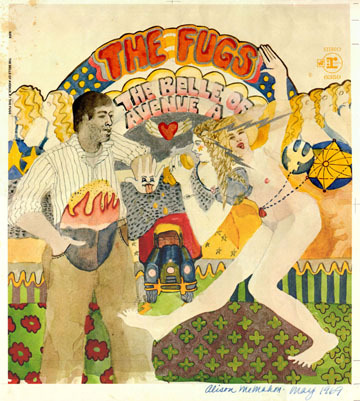 Even older than that, Ive finally put it up, is the 1969 Fugs' album cover I did for Warner Brothers: "The Belle of Avenue A:" an early excursion into the field of tasteful vulgarity. This is an album cover done for an east coast cult band (you know, those people who didn't think there was any culture west of the Hudson) by a beach kid (you know, one of those people who didn't think there was any life east of Pacific Coast Highway). "If you're a McMahon, you can never have enough hats." Watercolors a la prima, specializing in Architecture. ESL/Education: Teachers and students: For a list of reading and reference books for ESL and/or developing readers, go to Ali Baba's Annexe. If you like my art, you might like what I read: In association with Amazon Books, you can click on any book titles you see on this or other pages to look at and order at discounts of 20% - 40%. For a listing of relevant personal favorites, go to Ali Baba's Old Bookshop or Ali Baba's Constant Recommendations. For example, The Long Day Wanes, A Malayan Trilogy, by Anthony Burgess. Other of my personal favorites you can find there are Earthly Powers, by Anthony Burgess; Desolation Angels, by Jack Kerouac; and A Course in Miracles. Images are archived. Thanks for visiting. Let me know if you find any links that don't work.